There's a hurricane outside your house and it's throwing around cars, trees, and a bunch of other really heavy objects. Your goal is to take your HYPER MEGA BAT and knock away all the things that are flying at your house before they crush it. You get bonus points if you knock objects into other objects. 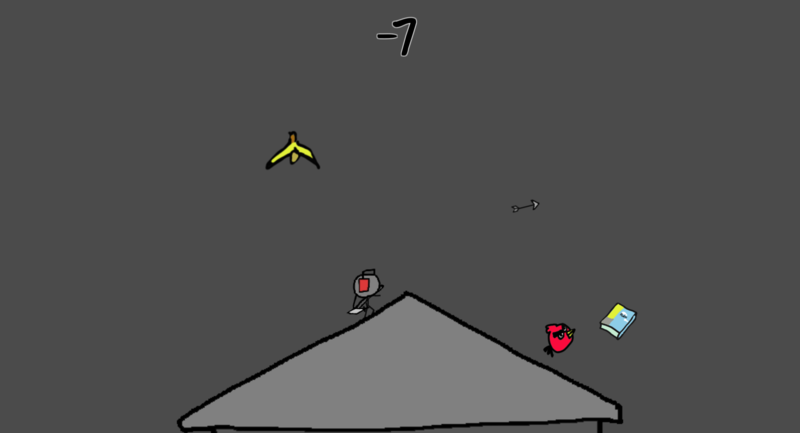 The game ends if your house is hit by 5 objects. >This is a 2D sidescroller, so you can run around and jump to reach up and knock things away if you need to. You've gotta be able to run around quickly to swat stuff. Because the professor allows us to modify the idea as we want. So I take the main concept of the player standing on a rooftop to fight against trash and make it into a more narrative driven game. Because this game is also a heavy action game, I made a podcast to tell the narrative of a world where people tends to throw rubbish to the rooftop and there are rooftop cleaners working hard every day. And the player acts as a cleaner to experience a weird day of hard work. If you want to give it a try, please don't watch the demo video.